I don't think we have any milongas in Sydney where the tango DJ plays the same playlist time after time.. if we do I have never heard about them. And certainly when I do the playlist for the Milonga de Mis Amores it is almost completely new every time - I even create new tandas, though I do have a handful of favourites, usually ones that people have commented on and these will re-appear from time to time. So I was quite horrified to read on my tango friend Bora's blog that "Canning had unusually less traffic that night and it seemed very quiet. Like at every other milonga, the playlist hadn’t changed from the last times I had been there".!! 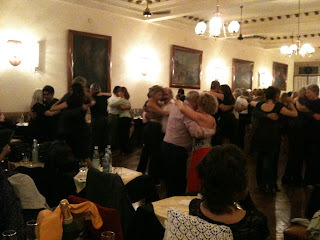 and later on she says " There are many ways to kill the mood at a milonga. Canning highlighted three that night: 1.Poorly arranged music, 2. Poor performances that leave people cold, and 3. Random chacarera to pick up the pace." I didn't go to Canning when I was in Buenos Aires in April, partly because last time I was there I didn't enjoy the milonga... and time was short, but when I go again next year I will check it out for myself. You can get away with the last two if the music is good and the chacarera only occurs because it is chacacera, not to pick up the pace - there are Sydney milongas that do the last two, but have great DJs. I'd be really interested to hear from people in other parts of the tango world about what their DJs do... Do you find the same playlists recurring at the milongas you go to? Do you recognise familiar tandas? Photo: Nuevo Chique where the DJ was described to me as the ''best in Buenos Aires" and his music was sublime. That's Dany Boreli. He also plays at Lo de Celia. He's been the DJ at these milongas, for many years, even when Chique was at Club Espanol--what a golden time that was!